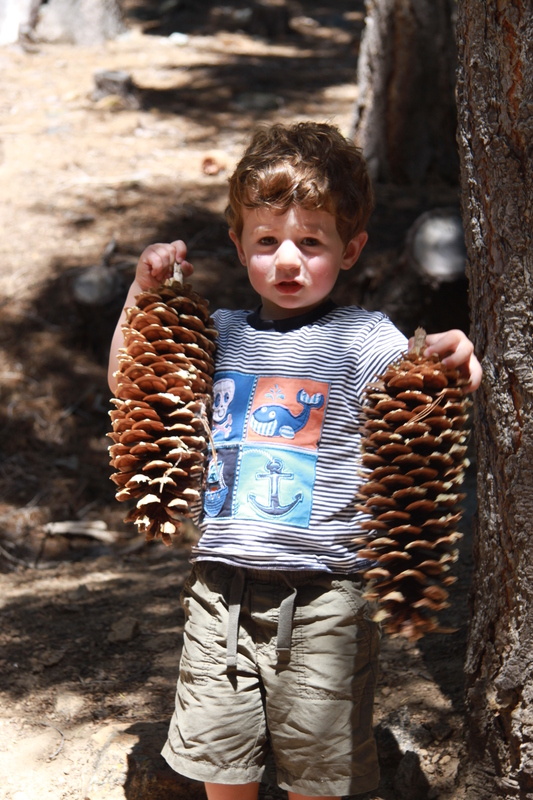 This September we took advantage of Portola Redwoods State Park’s reprieve from closure and booked a campsite for a weekend of hiking and exploring. I’d only ever visited the park before in winter when I found it a little limited and gloomy (perhaps because they’d removed the bridges and hence cut us off from most of the hiking trails for the season). This time, however, we really enjoyed ourselves. 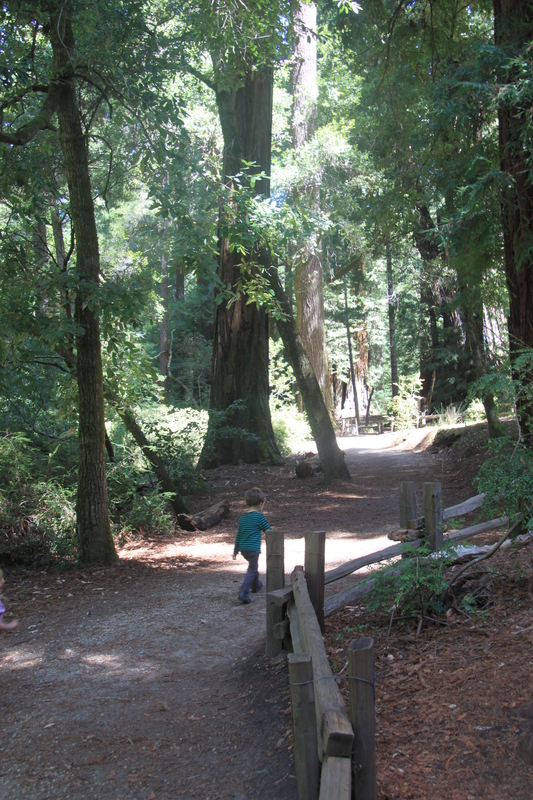 Perhaps it was the weather or the company or the great hiking trails, but we found Portola Redwoods to be a really fun and easy spot to visit with kids in the summer/fall. The camping is a bit of a mixed bag. 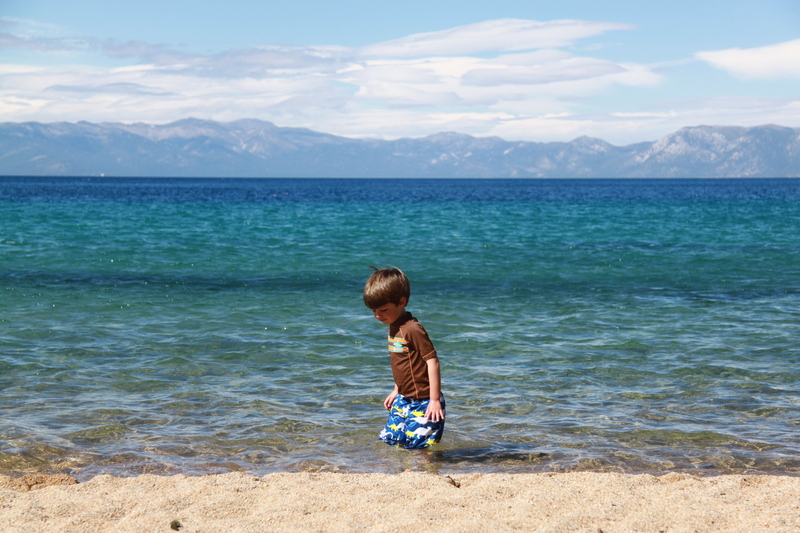 As is always the case with state parks, the sites vary in privacy and exposure. Although most of the sites in the main camping areas around the bathrooms are fairly large, they are also very open: there is almost no vegetation and few trees and it’s pretty much like camping in a field. I would imagine it gets very busy and noisy in high season–not ideal for camping with small children. I would recommend avoiding these loops and picking some of the sites on the edges of the campground (1, 2, 3, 4, 5, 6, 14, 28, 29, 38, 39, 40) if you want peace and privacy. And, don’t worry, the walk to the bathrooms from these sites is not the endurance hike some internet reviews make it out to be! 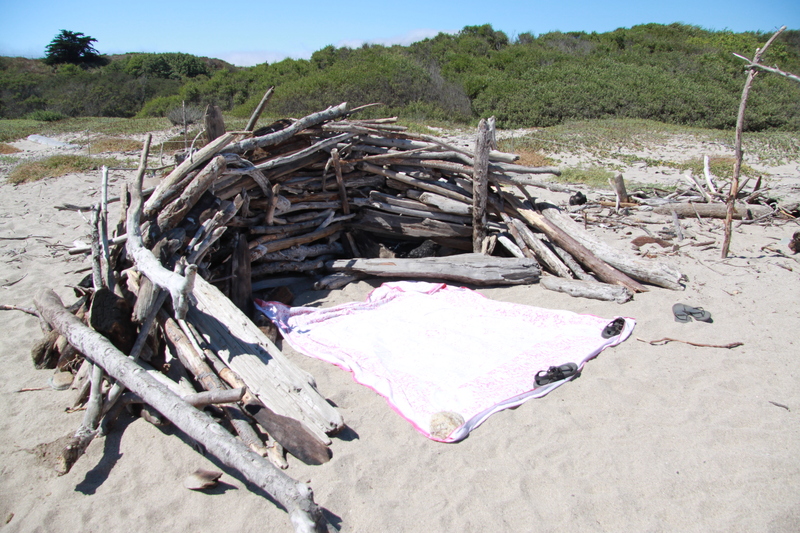 The campsite facilities at Portola Redwoods are limited. There are a couple of washrooms but the only hot, running water is to be found in the pay shower s(bring quarters). 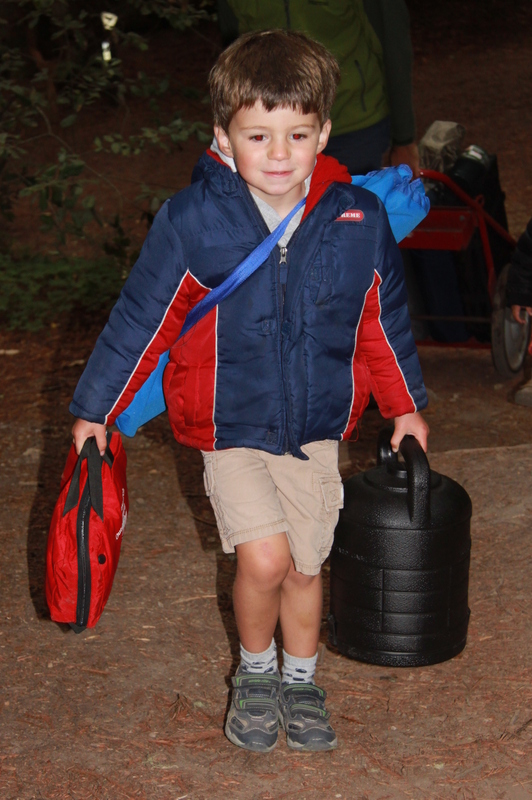 There are plentiful potable water taps and trash cans dotted around the campground. Firewood is available for purchase round the clock at the park office and visitors’ center, which is nice. I had read that this park is often plagued with mosquitoes, but we didn’t really see any this trip and I only received a couple of bites (which is exceptional as I am, apparently, so tasty that a lone mosquito twenty miles away will usually seek me out). 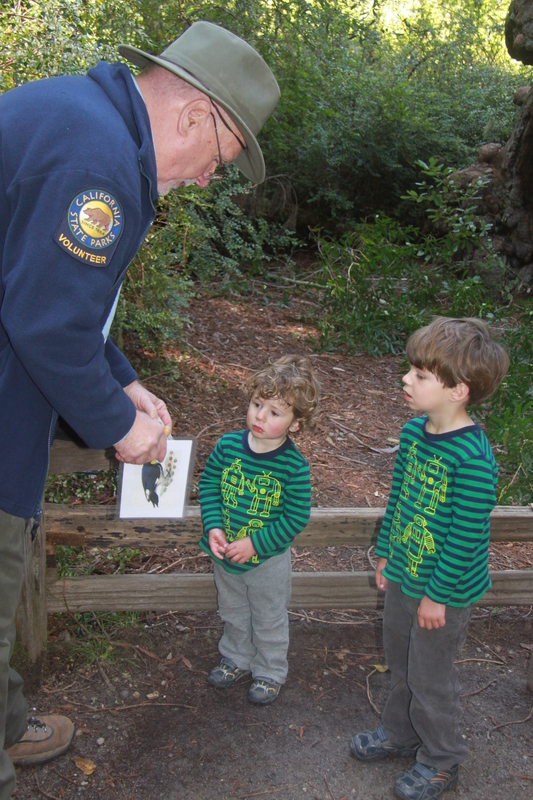 This short, easy trail leaves from behind the park office, goes down a gentle hill to the Pescadero Creek, crosses the water and loops through the woods on the other side, before returning over the same bridge and back up the trail to the visitors center. 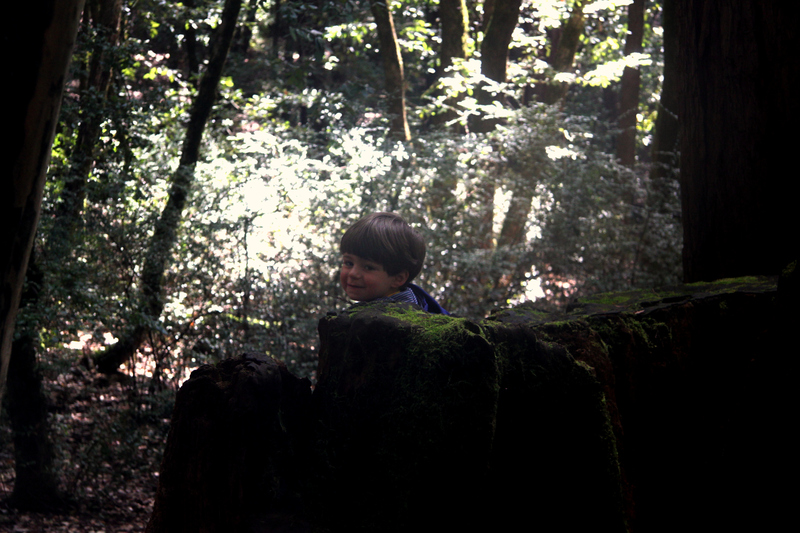 At 3/4 mile it’s a perfect little trail for very small children and reluctant hikers. It wouldn’t be ideal for strollers, but you could make it round with a rugged jog stroller as long as you didn’t mind carrying it up and down some steps by the river. I have to say that I think this trail is a little dull as guided nature trails go, but it does have the big positive of a rocky riverine beach where kids can spend time paddling and throwing stones. The visitors center is also worth a visit either before or after the walk. You can extend the Sequoia Nature Trail by skipping the ‘loop’ across the river and instead heading down the Iverson Trail once you’ve crossed the creek. The Iverson Trail loops through a spectacular part of the woods and loops back across the Creek to the picnic area by the park office. It’s a fairly easy trail (a little over a mile) with just a little clambering and no long ascents/descents. 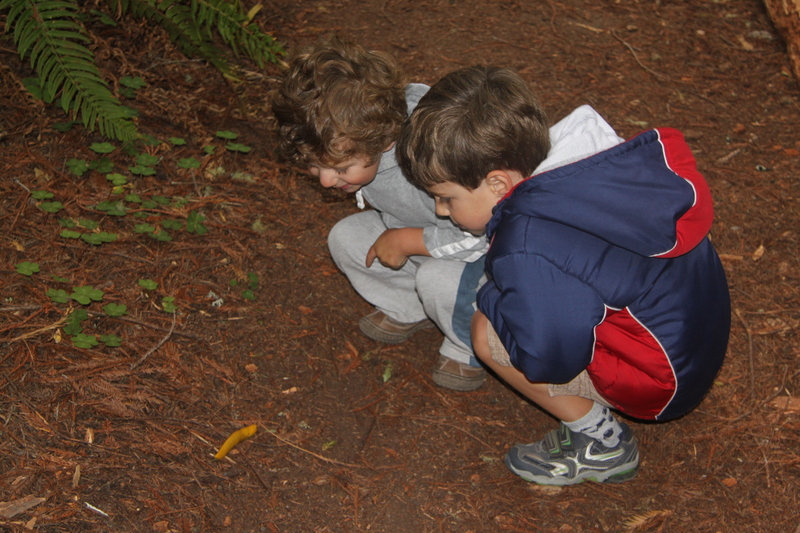 Our boys really enjoyed this as a quick hike that was a bit more satisfying than the nature trail. 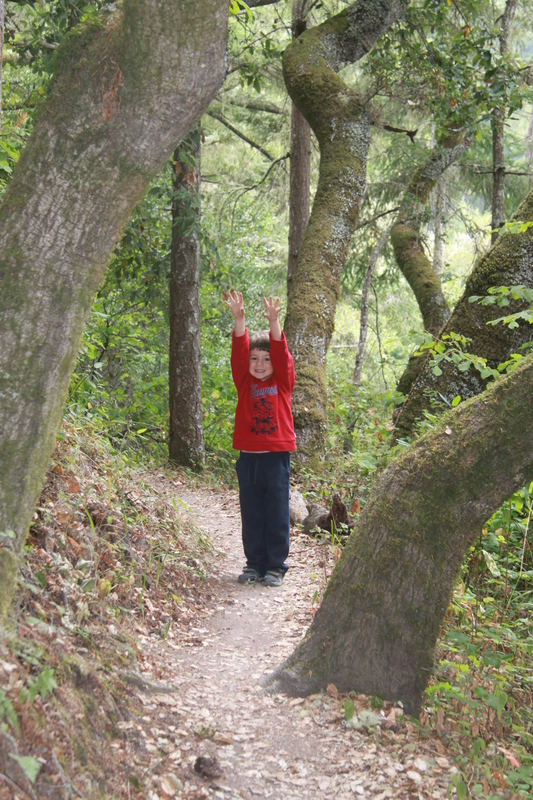 We took the Old Tree Trail from near the visitors center and then headed left up the hill on the Slate Creek Trail. At the junction with the Summit Trail we turned right and searched for ‘The Summit’ before heading down the hill, along the Service Road and onto the Iverson Trail. The boys were excited to see the Iverson Cabin Site and were a little disappointed that a) it’s only a pile of rubble and b)they weren’t allowed to play with said rubble. 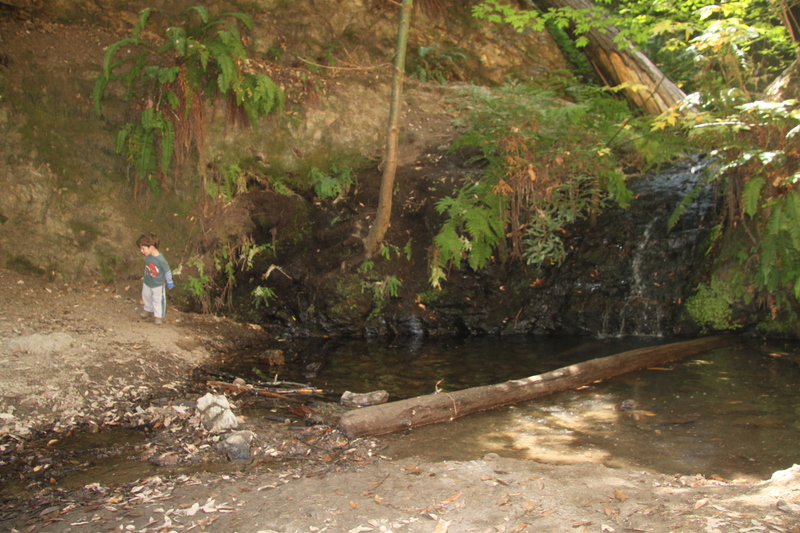 But they loved Tiptoe Falls a little further along the trail where we stopped for lunch and a paddle. From there it’s a short walk back up to the park office. This loop was a little over 4 miles and lots of fun, with some interesting ‘stops’ along the way. 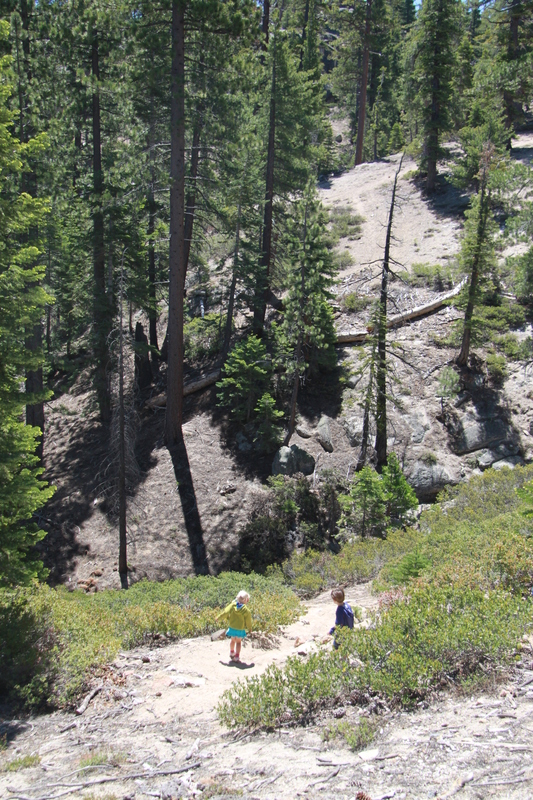 The ascent up to the summit is fairly arduous, however, and not for a toddler who doesn’t like to walk and the trail is definitely not stroller suitable. 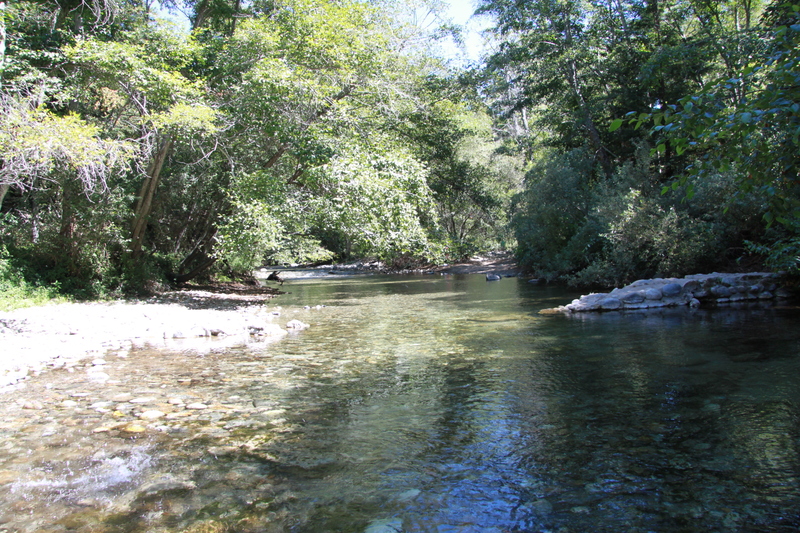 And if you don’t feel like hiking, you could easily pass an afternoon exploring the creek and throwing rocks into the water. 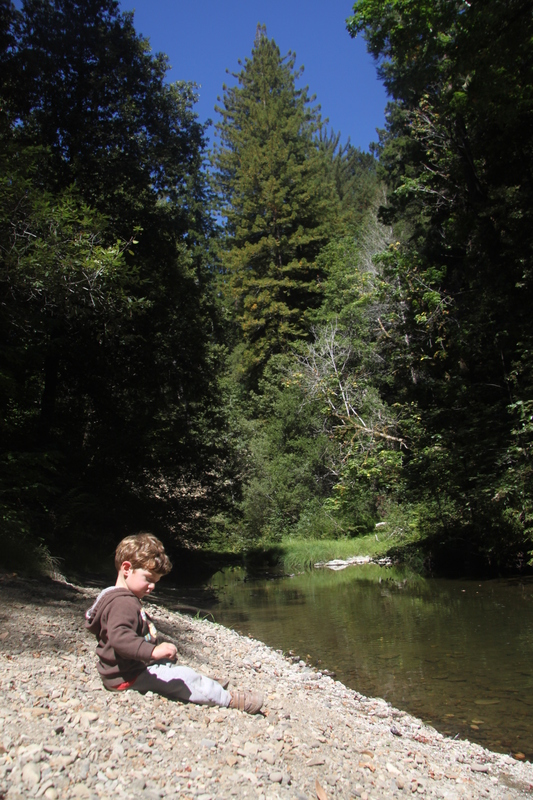 A couple of weeks ago we were looking for a morning hike that we could combine easily with an afternoon on the beach at Santa Cruz, and ended up at Henry Cowell Redwoods State Park. 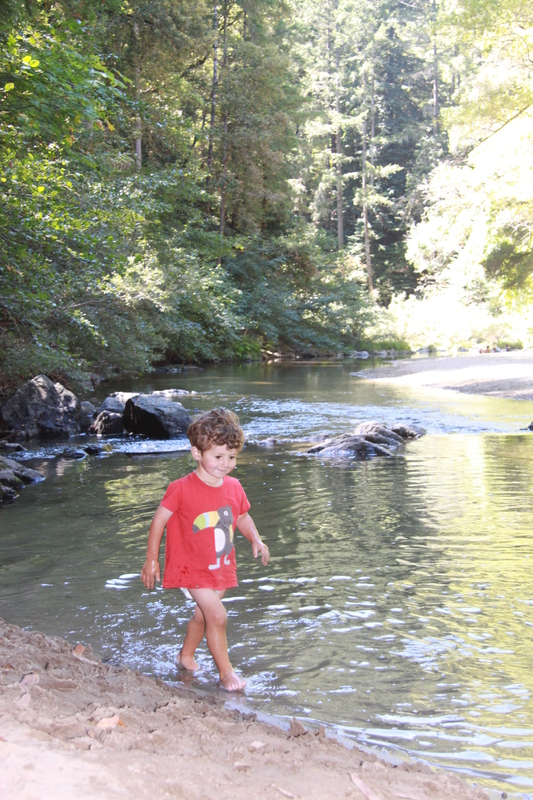 This was our first trip to Henry Cowell. While it looked beautiful from the brochure, most park reviews and trail guides seemed to suggest there weren’t many fun, short walks for little ones. I’m glad, however, that we finally made it out there. I can report that it is indeed a gorgeous park and that there are a number of fun activities and hikes that are perfect for the 2-5 year old age range. We started our morning in the main part of the park at the visitors center (the Fall Creek Unit of the park looks awesomely rugged, but less suitable for toddler hiking as all of the hikes are very long). There is a large car park here but parking spaces were in short supply when we returned to our car mid-afternoon, so I would suggest arriving in the morning on the weekend. The visitors center is wonderful: plenty of interesting, child-friendly exhibits about the park and super friendly staff. Our boys particularly loved the little booklets they were given about animal-print spotting and the ‘stamp’ table they could use to fill them in. Once completed, the Monkey proudly carried his around the nearby loop looking for prints. Right outside the visitor’s center is a short (under a mile) loop amongst the old growth redwood trees called The Redwood Grove Loop Trail. This path is wide, easy and flat–so easy in fact that we even saw a couple of wheel-chair users exploring there in the afternoon. 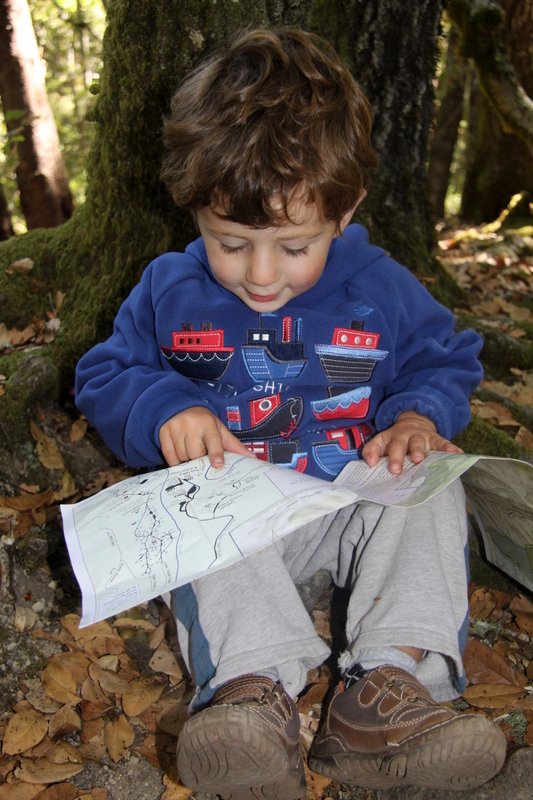 Unlike many of these parks, there were plentiful ‘nature trail guides’ available at the head of the loop. You can either purchase one for 25 cents (honour system but you might want to bring change) or borrow a ‘loaner’. 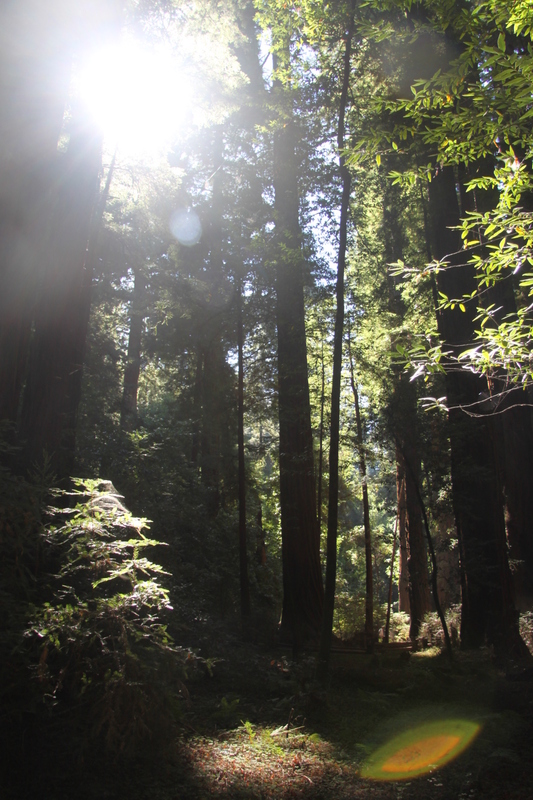 The redwoods in this area are pretty spectacular and the woods are beautiful. We were there early in the morning, which I highly recommend, and had the loop pretty much to ourselves and could enjoy the wonderful quiet and morning sunlight filtering through the canopy. Our kids loved the loop and working out what each of the numbers indicated. 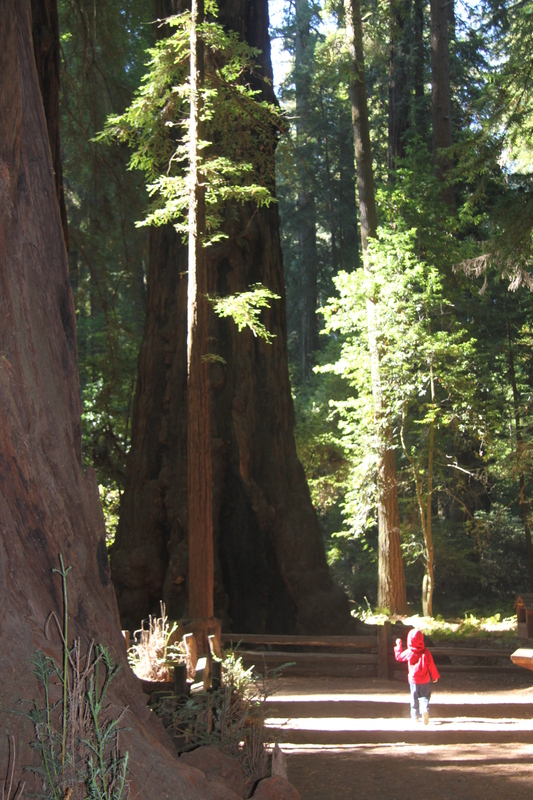 They also loved the enormous Fremont Tree with a giant, hollow cave beneath it (you might want to pack a small torch for exploring this very cool redwood). This loop is wonderful for very small kids. 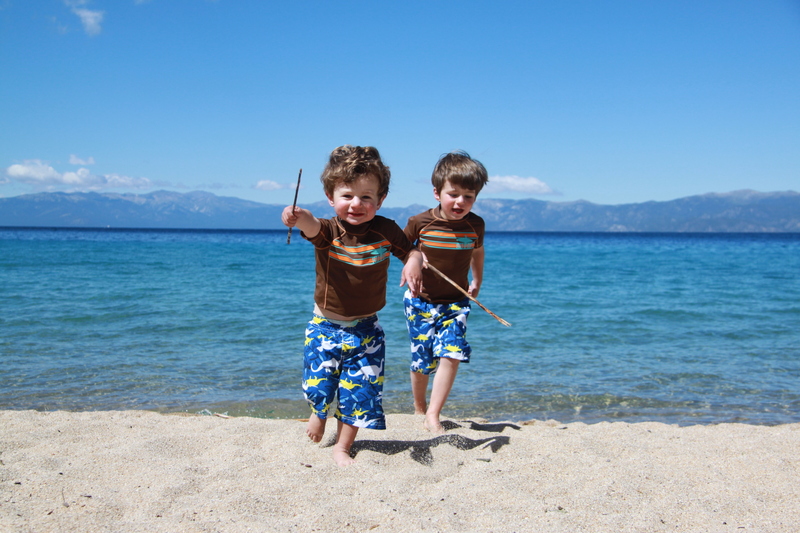 On its own, however, it wasn’t too satisfying for our boys –too short and too easy–so we headed on into the park. At the far end of the loop you can cut through to the River Trail. 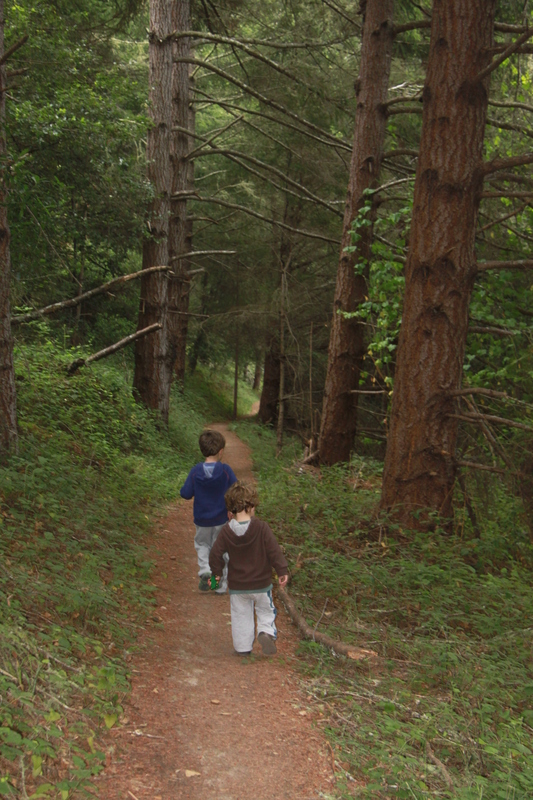 The boys enjoyed this wide, easy, flat road as it runs alongside the roaring camp railway track and under the railway bridge. We then took the narrow trail off to the right of the road along the creek. 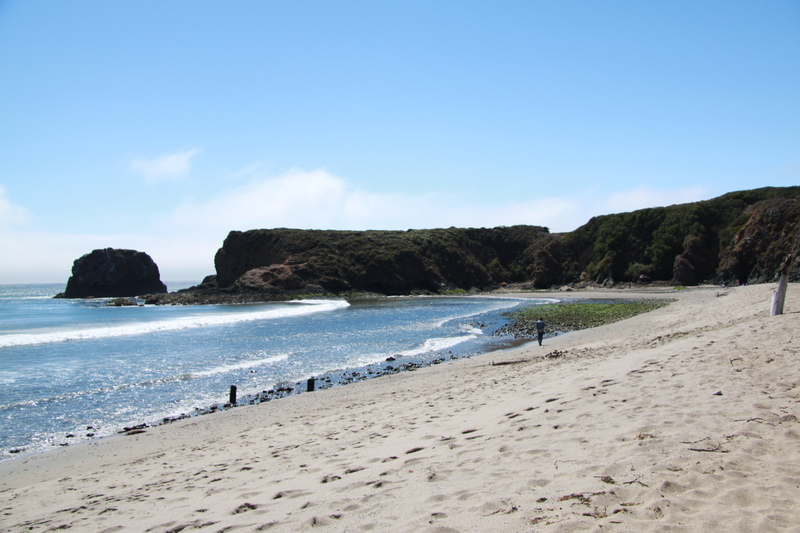 After a quarter of a mile, this trail leads to the lovely Cable Car Beach. 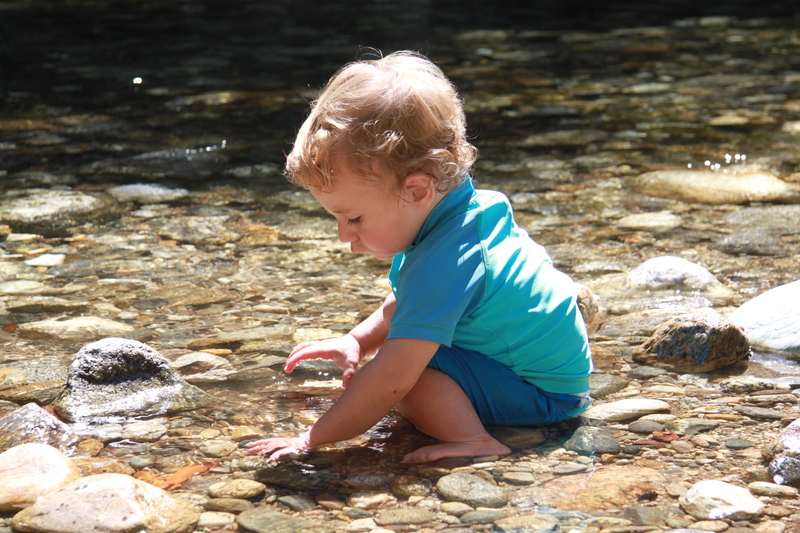 This is a great spot for paddling and creek play. Our boys loved it and could have stayed for hours. 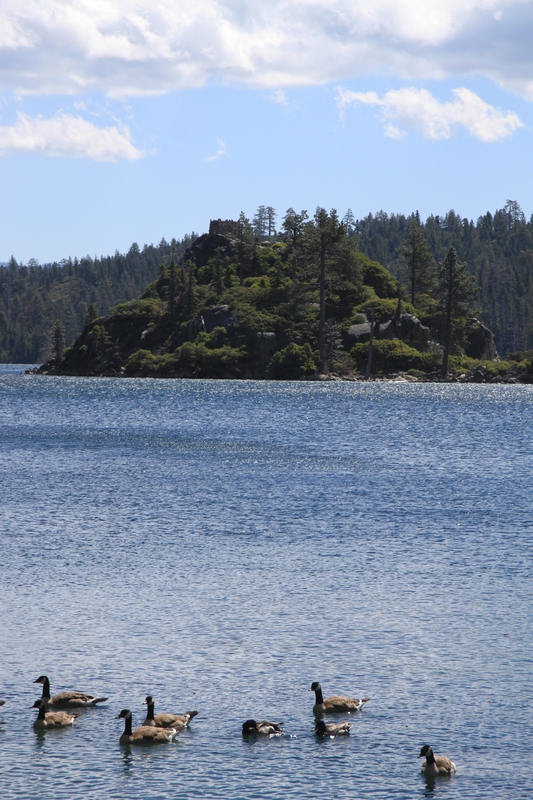 If you’re planning to camp at the park, this would be the perfect spot–in summer, anyway, when the water is low–for playing with a small, inflatable boat or ring. 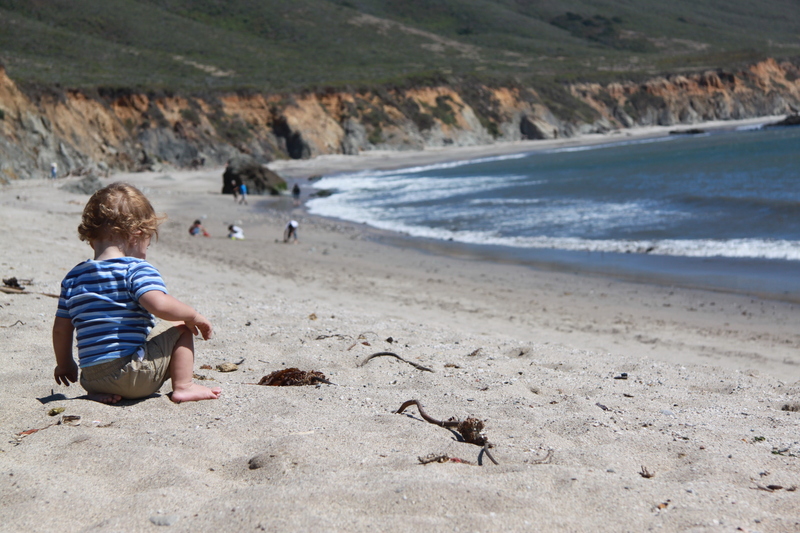 A hike out to Cable Car Beach via the Redwoods Loop may be enough for many small children: it’s about 1.5 miles there and back and has a fun destination. If you want to walk further you could take a hike up to the top of the ridge. We took the Eagle Creek trail from Cable Car Beach and then the Pine Trail up to the observation point. We returned via the Ridge Fire Road and Pipeline Road and stopped at Cable Car Beach to play on the way down. This was a fun, but fairly tough, walk. 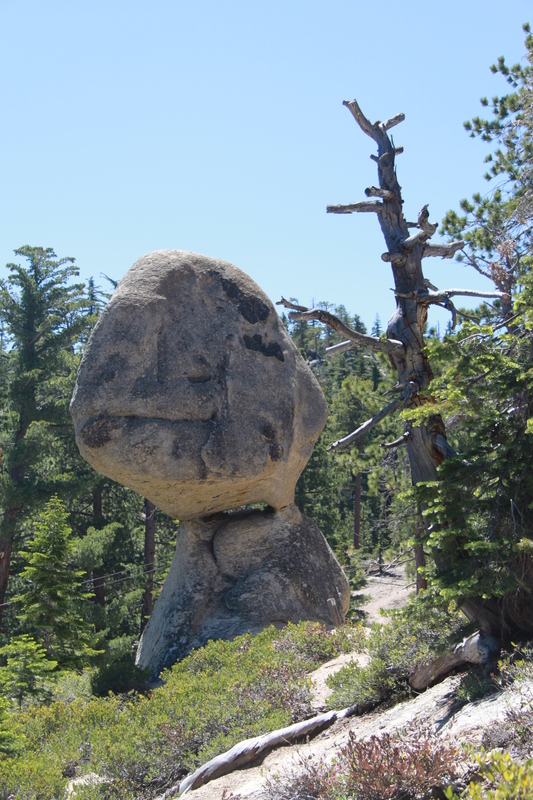 If you’re going to attempt it with small kids, be aware that it’s about 4 miles round, has a long ascent, and that the trail at the top is sandy and hard-going on little legs. 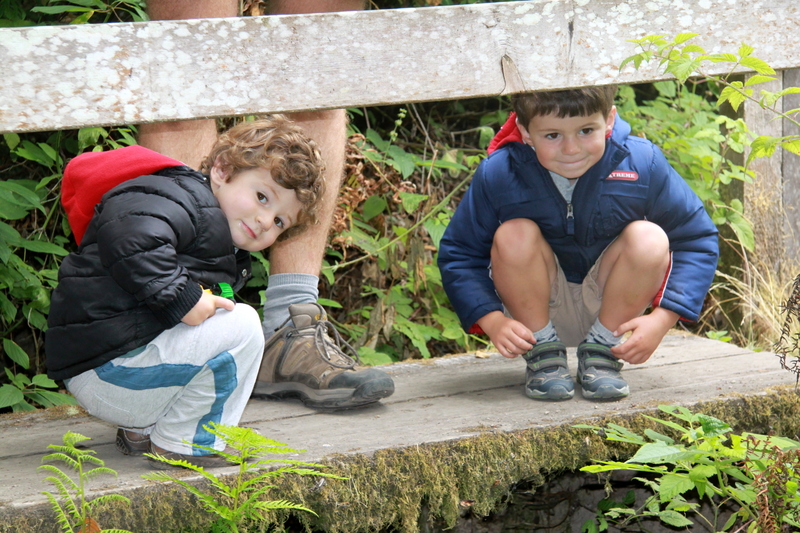 Our three year old managed it in good spirits, but the two year old retreated to the backpack for the return leg. 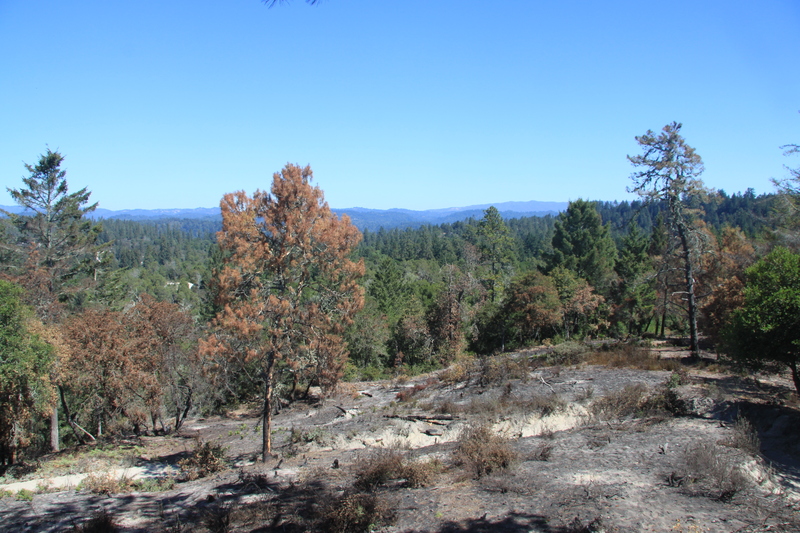 Warning aside, it is a beautiful trail and the sandy landscape at the top of the ridge is interesting and the views magnificent.